One of the most common hot weather dangers for pets is becoming dehydrated, which can happen quickly in the summer. Signs of dehydration and overheating in pets include difficulty breathing (panting), increased heart rate, weakness, vomiting, diarrhea, and elevated body temperature. Dehydration and overheating can lead to seizures, heat stroke and unfortunately, even death. To avoid this sad situation, make sure your pet always has access to a supply of fresh, clean water. And even though your pet may be active and happy to be outside, do not over-exercise them or let them become overheated. To be on the safe side, keep your pet in the shade as much as possible and exercise when the temperatures are cooler, either very early in the morning around sunrise or after sunset. If your pet is showing signs of heat stress, place a damp towel over its body and bring your pet to the vet as soon as possible. If your dog or cat is very young, older, overweight, sick, or has cardiovascular or respiratory conditions or a flat face (a brachycephalic breed), it is better to keep forego outdoor exercise in the hot weather and stick to indoor activities in cool, comfortable air conditioning. Every year there are tragedies in the news about pets dying because they were left in a hot car. Don’t leave your pet in a car – ever. A car‒even in the shade, with a window cracked open and in moderate temperatures‒can spike to sky-high temps in just minutes, causing an animal to have heat stroke, brain damage, and suffocate. If you must bring your pet with you on your car ride, take your pet with you any time and every time you leave the car. Even if the air temperature does not feel that warm, the ground temperature can be much higher. The Sequoia Humane Society cites research that shows that if the air temperature is 77 degrees, the asphalt temperature could be 125 degrees! If asphalt feels too hot when you touch it with your back of your hand, it is too hot for your pet. Paw pads are not covered with fur and they can burn on hot asphalt, just as your feet would if you were to walk on it with your bare feet. If you must walk your pet on asphalt, wait until the outdoor temperature is cooler, such as the very early morning or evening. Pooch and Claws has some other valuable asphalt safety tips. Not all dogs swim and they should not be left unattended by a swimming pool. A dog might fall in accidentally, give in to curiosity, or jump in to cool off, without knowing how to get out safely. Barkbusters has an informative tip sheet on how to keep your dog safe by the pool. If your dog shows an interest in the water and enjoys getting wet, consider purchasing a small kiddie pool to help it keep cool. Bring your pet to the vet to make sure it is being protected from heartworm fleas, ticks and other pests. Many people are surprised to learn that dogs and cats can get sunburn. Not only is sunburn painful, but it can also make pets more susceptible to skin cancer, which according to Prevention.com, is the most common form of cancer in dogs. Fortunately, there are sunscreens made especially for pets that can protect them from the sun. Pet sunscreens can be purchased online or ask your vet for recommendations. 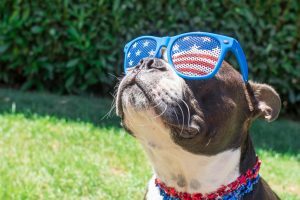 By taking these important precautions, you and your furry friend can have fun in the summer sun and stay safe and comfortable all season long. This information is not intended to be a substitute for professional veterinary advice. This website is for informational purposes only. Omni advises readers to seek the advice of a veterinarian or other qualified veterinary health care provider with any questions regarding a pet’s health or medical conditions. If you suspect your pet has a medical problem, please contact a qualified veterinary health care professional as soon as possible.